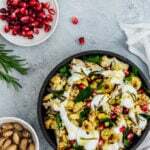 Cauliflower will never be overlooked in your home once you try this Roasted Curried Cauliflower Salad with pomegranate arils, pistachios and a simple yogurt dressing. Are salads just for summer months? Do you ever crave for a good salad in cooler months? No? I definitely do. A salad with heartier winter vegetables is irresistible to me, but it has to be really tasty like this roasted curried cauliflower salad. Besides being a perfect side dish to complement any main course, this salad makes an awesome vegetarian lunch or dinner on its own too. On our blog, I always share the recipes that my small family and I love, but some recipes are so satisfying that I can’t wait to share with you here. This salad is one of those recipes as it is super tasty, easy and quick. When I first made it last week and shared the super easy steps on our Instagram story, several people asked for the full recipe. Plus, my carnivore husband gobbled it up. I was so surprised that he did so. “Is it really cauliflower I’m enjoying to eat now? This is incredibly tasty!” he said. No need to mention how heartily our 4-year-old son ate it because he loves veggies. One of his favorite dishes is Turkish Braised Green Beans with Tomatoes. Check it out if you want to try a new green bean recipe for your Thanksgiving menu. Who can refuse a satisfying salad that makes you feel good? 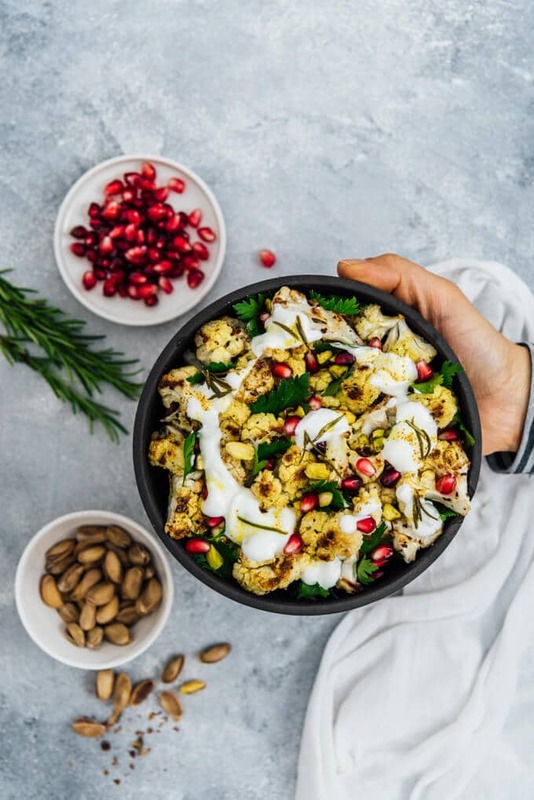 This Roasted Curried Cauliflower Salad with Yogurt fits the bill if you are looking for that kind of a salad. It is so good that you will want to put the main course aside and full your stomach with this salad. I think the reason why someone doesn’t love cauliflower is that they haven’t met the right recipe yet. Everyone has to give this salad a try and there won’t be any cauliflower haters left on earth. First, cauliflower florets are roasted. Cauliflower takes any recipe to the next level when roasted. Just like in our Roasted Cauliflower Hummus recipe. I can eat all of it at this step as roasted cauliflower is one of my weaknesses, but it’s worth waiting for this salad. Secondly, Greek yogurt is a perfect match for roasted cauliflower and you can use it as much as you want on our salad. What’s more, pomegranate arils, pistachios and parsley leaves not only give it a nice crunchiness, but they also make it even healthier. Finally, what takes the salad to the next level is the curry sauce on it. Olive oil, curry powder, rosemary and white vinegar come together in the sauce which tantalizes all your taste buds. No need to boil or steam the cauliflower florets beforehand. They are perfectly tender when roasted at 425F. Just stir it occasionally towards the end of the baking time. Make sure you place the cauliflower florets in the pan in one layer. Otherwise they won’t be well roasted. I season the cauliflower florets only with salt and black pepper when roasting. You can add your favorite spices if you want. Do the seasoning in the same pan. Place the cauliflower florets in the pan, season with salt and black pepper and drizzle olive oil. Using your hands or a spoon, give it a stir so that all the florets are coated with the spices and olive oil. I use parsley as a herb because it doesn’t have a strong flavor, but you can use whatever herb you have on hand. If the Greek yogurt you use is quite thick, simply whip it up with a little water to have a nice consistency. 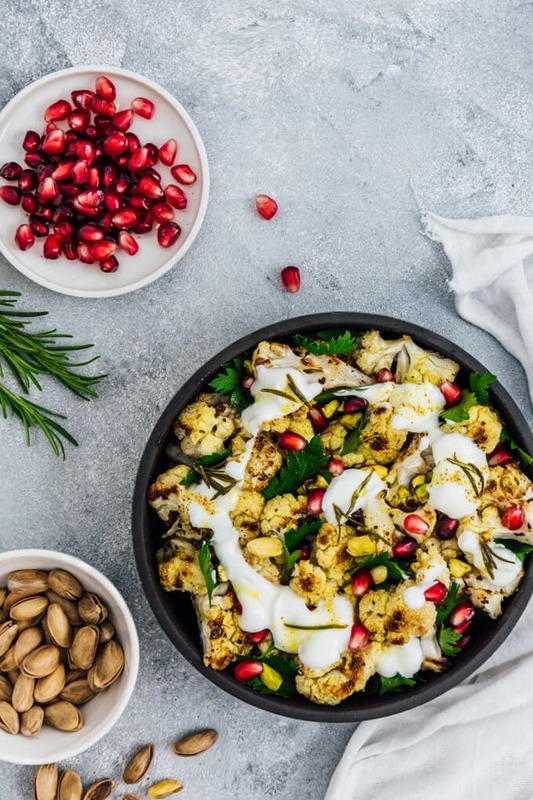 Roasted cauliflower florets combine with pomegranate arils and pistachios and topped with yogurt and curry sauce. Preheat oven to 425F. Line a baking pan with parchment paper. Place cauliflower florets in the pan in one layer. Sprinkle salt and ground black pepper over them. Drizzle olive oil over them and stir well so that all the florets are coated with spices and olive oil. Bake for 40 minutes or until browned and tender, stirring occasionally towards the end of baking time. Remove from oven and let it cool. For the curry sauce, heat olive oil in a small skillet. Add in curry powder and rosemary and cook one minute, stirring frequently. Remove it from heat and stir in the vinegar. Transfer the roasted cauliflower florets in a salad bowl. Add in pomegranate arils, chopped pistachio and parsley leaves. Whip up the Greek yogurt with water and top the salad with it. You can use as much as you like. Drizzle the curry sauce evenly over the salad.